Conveniently accessed by interstate highway and the Ohio Turnpike, our service and repair facility is capable of handing equipment to 20,000 pounds. We service and repair all types of rotating equipment as well as provide reconditioning services that include machining, dynamic balancing, weld repair, metal spray, industrial coatings, parts duplicating, and complete remanufacturing to provide many years of future service. Why discard your existing equipment when it HAS VALUE? 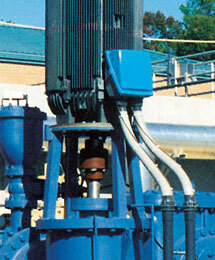 National Pump and Process can economically recondition equipment to its "as new" condition. Our rebuild capabilities are extraordinary and our rebuilds carry the manufacture's original warranty. Most rebuilds cost less than 50 % of new equipment. National Pump can rebuild ANY single or multi-stage, process or feedwater pump to "as new" condition through processes that include weld repair, metalizing, machining, line boring, replication of impellers, manufacture of shafts, sleeves, and wear rings. We also provide advanced packing, mechanical seal, and bearing protection options. We offer complete retrofits of existing assemblies including baseplate fabrication, electric motor, diesel, and steam turbine drivers, control panels and control systems, programmable logic controllers (PLCs), variable frequency drives and motors from our partners at GE, USEM, and Baldor Electric.